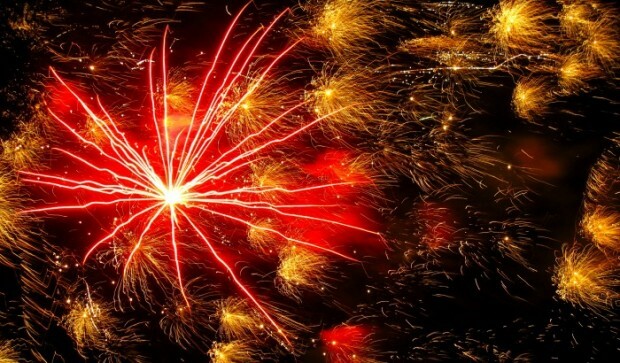 It’s that time of the year and I don’t mean fireworks; I’m talking the explosive media grilling blitz. An hour doesn’t pass without some TV personality, electronic feed, or magazine headline firing off their ultimate recipe for “whatever” on the grill. Recipe overload, no doubt. Why not? 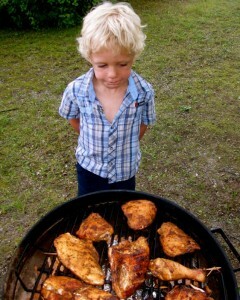 Grilling on the Fourth of July is as traditional to the American landscape as enjoying a hot dog at a Tiger’s game. So allow me to stoke the flames by tossing my favorite recipes into the pit. I’ve made everyone of them with great success in season’s past. Beginning with Grilled Firecracker Shrimp. I like this peel-as-you-eat recipe because the eaters do the shelling; I just make the Asian dipping sauce. Not that I’m totally lazy; large shrimp taste better, and are more moist with a better texture, when grilled in the shell. No time – no grill? Try this recipe for No-Fuss Barbecue Ribs with fall-off-the-bone flavor. 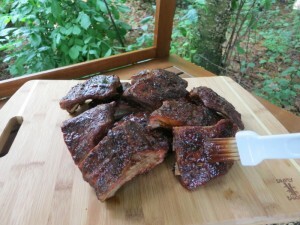 Here’s a recipe for a more traditional smoked rib, so so good. All the time in the world? 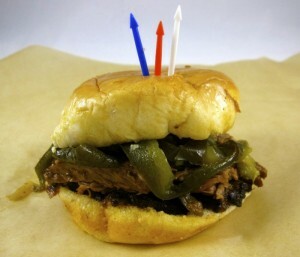 Smoked Barbecued Brisket with Grilled Poblanos and Onions brings folks to their knees. And for time in between, cross the border with Firecracker Flank Steak with Margarita Flavors and Mango Salsa, or Grilled Tuscan Flank Steak, including a sauce that reminds of an herbaceous Chimichuri. A full menu of Burgers awaits your grill; every type of burger under the sun. Here’s an idea for tote cuisine, if you’re bringing the main course to a picnic, or other outdoor celebration. If fact, I did this last week. I purchased boneless, skin-on chicken breasts and thighs from Whole Foods (pre-oredered) using the marinade in this Balsamic Chicken recipe, marinated the chicken 8 hours, then carted the chicken, ready for the grill, in resealable Zip-lock bags. The chicken cooks quickly without the bone. Stay vigilant moving the chicken from possible dripping fat flare-ups; I believe it’s worth the effort as the skin keeps the chicken moist and flavorful on the grill. I like these two salads as they perform well outdoors under the heat of the sun: Tomato-Basil Pasta Salad and Uptown Picnic Potato Salad. 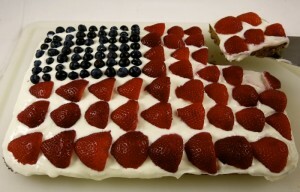 For dessert finish with this “healthified” Fourth of July Sheet Cake. Whew! That’s my recipe explosion. This year I’m experimenting making Lamb Burgers with Tzadziki and Beet Relish. More than likely, my next post. Wishing you safe travels and clear skies!